This is the third in a series of articles on this theme. If knowing and acting on your “why” is a powerful guiding force that requires a very strong emotional commitment, it is unlikely you can get to it without being happy. In “The Happiness Advantage: The Seven Principles of Positive Psychology That Fuel Success and Performance,” positive psychologist Shawn Anchor similarly suggests that rather than success being the precursor of happiness — happiness in fact leads to success. When our brains get stuck in a pattern that focuses on stress, negativity and failure, we set ourselves up to fail, positive psychologists such as Anchor might say. Undoing negative patterns and establishing positive patterns are key. When our brains develop the habit of looking for the positive, we profit from not only increased feelings of happiness, but enhanced feelings of gratitude and optimism seem to be more likely. Many classic studies in psychology have shown that simply the act of being happy, grateful or optimistic, even in contrived experimental settings, leads to actual enhanced feelings of all three positive psychological experiences. Although you’re unlikely to find a formal curriculum on the topic, a fundamental purpose of school is to teach students how to be happy. Students certainly can be happy as a reaction to curriculum content. For example, most students react positively to a favorite subject because they have an affinity for it and it brings them pleasure in and of itself. Schools can also intentionally educate for happiness. This becomes especially important for students with long-term patterns of school-related stress, negativity and failure. Negative experiences associated with learning and schools, especially when they persist over a period of time, take their toll. These experiences undercut creativity, raise stress levels and lower motivation. Thus, helping students find their path to happiness is even more critical. 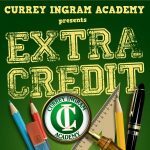 At Currey Ingram, we educate students with learning differences who may have had negative experiences in their previous school settings. Here, it is an explicit and critical component of our educational program to ensure our students are exposed to experiences that bring them real, earned happiness. We provide built-in, systematic and substantive success experiences through athletics, the arts and extracurriculars, as well as in the classrooms. For example, in the Lower School, students are recognized at regular Success Assemblies. Middle School students are Caught with Character and recognized during regular morning announcements. In the Upper School, a strong teacher-student mentoring program and student-led conferences intentionally provide our older students with opportunities to frame their experiences and build on past successes. The school experience, just like the human experience, is a social enterprise. There is an entire life of schools that never really appears in the stated curriculum. It is mainly within the interactions that students have with one another and with educators that they are educated towards happiness. The educator’s charge, in fact, is to establish a tone of happiness — to model a happy or grateful response even to life’s stressors and to point students toward success experiences that are real and meaningful. If you are concerned with your children’s happiness, or your students’ happiness, I highly recommend Shawn Anchor’s book. I think it feeds nicely into the common wisdom of our day that is pointing more and more schools toward holistic practices, mindfulness and service learning. The takeaway, of course, is that when we’re happy we operate at our highest potential. We are more likely to not only know what and how, but also the ever-important why.